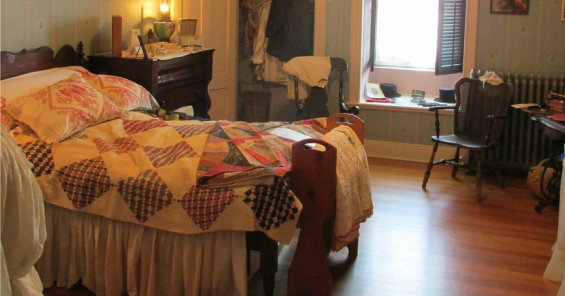 This room reflects the lifestyle of men and women at the turn of the century. The bed this room is typical of those used in the last half of the 19th century. It is higher off the floor than modern beds, keeping the sleeper away from cold drafts. The bed features a feather mattress, or featherbed. Each morning the bed covers had to be removed so the featherbed could be fluffed for the next night’s sleep. A chamber pot, next to the bed, is a reminder of the days when there was no inside plumbing. Other items of interest are a silver-plated glove box, holding several pairs of gloves, which were an important accessory. ​A glove index shows how the size of a women’s hand was measured. A wash stand holds a wash bowl and pitcher and a shaving brush for the man of the house.